FIRST PRESBYTERIAN CHURCH was organized in 1854, and built its first building in 1858 on Sixth Street. In 1867, they built a large Gothic revival building on the northeast corner of Seventh and Jules Street. In 1876, several members traveled to the Centennial Exposition in Philadelphia, where they purchased a bell for the tower and placed an order with the E. & G. G. Hook Co. for a two manual, 25 rank tracker pipe organ, which was installed about 1878 as Opus 889. In 1909, structural problems forced the demolition of this building, and on the same site, they built the present landmark Georgian Colonial revival building, designed by local architects, Edmund J. Eckel and Walter Boschen. The Colonial style was gaining popularity in residential design at the time, and Eckel employed rich detail, including Harvard brick and outstanding interior ornamentation in this design. The sanctuary features a Tiffany window in the chancel and was originally decorated by that firm. 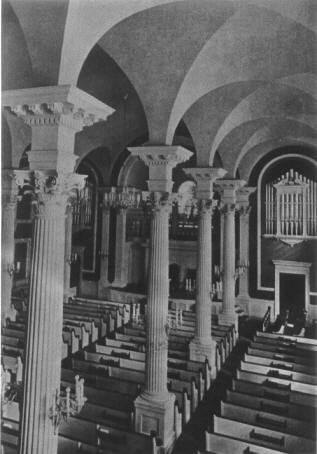 Prior to demolition, the old organ was removed to the Hook factory, where it was converted to tubular pneumatic action for re-installation in the new building in 1911. The organ underwent a less than successful rebuild in the 1950's and in 1988, the congregation elected to replace the instrument and redesign the chancel area. The new organ, built by the Visser Rowland Co., Houston, was installed as their Opus 84 and contains 46 ranks, on slider windchests with electric key action. It features flamed copper facade pipes. The console contains a mechanism that allows it to float on a cushion of air while being moved.